LEG assisted a major property owner and developer at Millbrae Station with joint development negotiation with the California High Speed Rail Authority that included property exchange, land lease revenue sharing, joint use of parking and station entrance planning. LEG prepared the economic and employment impact assessment for the Los Angeles River Bikeway and Greenway Project as part of the design and feasibility team led by Gruen Associates. LEG analyzed the retail space requirements of the connector station that linked the LAX People Mover, Metro Light Rail and a bus transit center as part of the design contract led by Gruen Associates. Bill Lee served as the senior real estate economist and financial analyst in the Exposition Line Station Area Specific Plan preparation. He designed the financial model to analyze development opportunities induced by the transit investment and proposed up-zoning. The model was then used to estimate the financial capacity of new development to carry the cost of community benefit improvements and recommended a set of policies to fund these improvements. While at ERA, Bill Lee served as Project Manager for a major assignment for the California Intercity High Speed Rail Commission. Acting as lead contractor, he directed a team that examined the economic impact and benefit versus cost implications of the construction and operations of a high-speed rail system linking the Los Angeles basin with the San Francisco Bay Area. Bill was also responsible for evaluating the impact on the California economy overall, including different sectors of the economy, the geographic distribution of economic activity, and station area land development for 24 proposed stations. Bill Lee and Tanya Chiranakhon prepared a regional real estate market and economic impact assessment of a proposed BRT connector system that will serve Houston's Uptown District. The assessment was instrumental in the District securing the necessary funding, which included a $20 million capital grant, to implement the BRT system. Bill Lee, while at AECOM, was retained by the Auckland Regional Transport Authority and Kiwi Rail to serve as Technical Lead for the Auckland CBD Rail Loop Business Case. Bill was brought in to incorporate CBD regeneration into the benefit versus cost analysis to account for the impact of this rail project in shaping the future of Central Auckland for decades to come. His groundbreaking evaluation was instrumental to the New Zealand Central Government's decision to fund the largest infrastructure project in the history of the country. Bill Lee served as the lead planning economist for the Specific Plan and Environmental Impact Report for the Diridon Station Planning Area. Future plans would add BART and high speed rail service to Diridon Station, which already has bus, light rail and commuter rail service. The study included analysis of the real estate market outlook for the Station Area, evaluation of plan alternatives, and recommendations for financing strategies for the public improvements. BART is planning a $4 billion dollar extension into Santa Clara County with six stations in Milpitas, San Jose and Santa Clara. 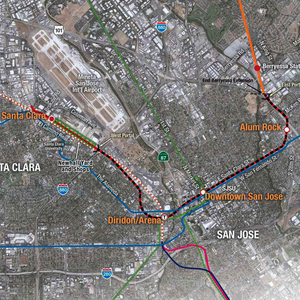 The Santa Clara Valley Transportation Authority, the agency responsible for planning and financing this extension, retained Bill Lee (while at ERA) to examine joint development opportunities within a half mile of the six stations. Bill also advised top VTA management concerning other revenue vehicles, such as transit benefit assessment districts, impact fees and cost sharing agreements with developers or land owners.